A series of webinars about HRE project during spring and autumn 2018. In 2018, the most important take-aways of the project were presented in a series of 14 webinars. The project’s methods and results were introduced and the value of the findings will be explained to the audience in 15 one-hour sessions. Click on webinar title below to reach video or watch them on our YouTube Channel! 1. 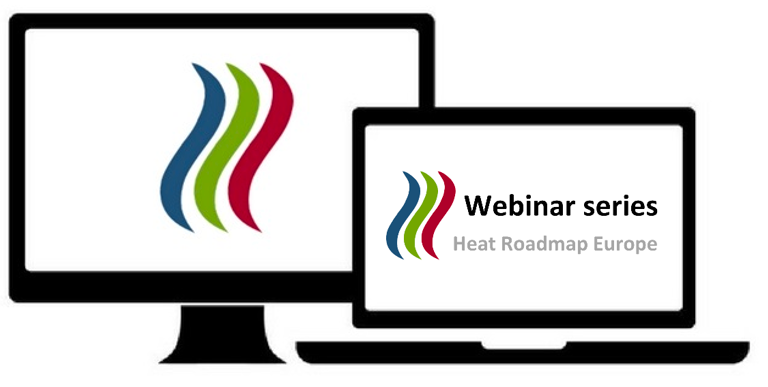 What is Heat Roadmap Europe? 2. Energy mapping: matching potentials and demands for heating and cooling. 3. The potential of large-scale heat pumps in heating systems and integrated energy systems. 4. Energy savings and synergies within industry and the energy supply. 5. HRE facilitating integrated energy dialogues in cities and regions. 6. Energy profiles: What is the heating and cooling demand used for in EU? 7. Energy savings potentials in buildings and the importance of low-temperature heat demands. 8. HRE Scenarios and Results – Roadmaps for decarbonising H&C Sector in EU. 9. HRE results & H&C strategies for countries and regions with a developed gas sector. 10. The energy transition, combining the strengths of different energy models. 11. HRE results & H&C strategies for countries and regions with traditions of heat planning. 12. HRE results & H&C strategies for countries and regions with deteriorating heating and cooling. 13. Cool Roadmaps in Europe: Cooling demands and future of cooling and DC. 14. HRE results & H&C strategies for countries and regions with underrated heat demand. Brian Vad Mathiesen, Professor at Aalborg University, Denmark, and Coordinator of Heat Roadmap Europe, introduces the project, explains its purpose and contribution and presents the achievements so far. Bernd Möller, Professor at Europa-Universtät Flensburg, explains the importance of energy mapping in Europe and the contribution of Pan-European Thermal Atlas (Peta 4.2) along with the methodology behind it and how it is used. Susana Paardekooper, PhD Fellow at Aalborg University, hosts and sets the frame of Heat Roadmap Europe and Carsten Rothballer, ‎Climate Policy Officer at ICLEI, share his comments. Brian Vad Mathiesen, Professor at Aalborg University and HRE Coordinator, and Andrei David, PhD Fellow at Aalborg Univeristy, talk about the role and the use of large-scale heat pumps in heating systems and integrated energy systems. Thomas Novak, Secretary General of European Heat Pump Association, takes part in the panel discussion. Bas van Zuijlen, Researcher at Utrecht University, presents the methodology of calculating the cost for reducing heating and cooling demand in industry. Susana Paardekooper, PhD Fellow at Aalborg University, hosts and sets the frame of Heat Roadmap Europe. Atli Benonysson, Vice president, Application Center, Danfoss A/S, member of the HRE Advisory Board, participates in the panel discussion. George Stiff, Officer at Sustainable Resources, Climate and Resilience team, ICLEI Europe, explores the beneficial role that Heat Roadmap Europe can play to facilitate strategic city and regional energy planning. David Drysdale, PhD Fellow at Aalborg University, as representative of the lighthouse demonstration project SmartEnCity, reflects on the potential of Heat Roadmap Europe project tools and results. Tudor Drambarean, Project Manager at Alba Iulia Municipality, Romania, provides insights on a city-level applicability of HRE. Tobias Fleiter, Coordinator at Fraunhofer ISI, presents the data about heating and cooling profiles along with their use in the baseline scenarios for the current energy systems in Europe. Joana Neves, Research Assistant, Aalborg University, hosts the session and set the frame of Heat Roadmap Europe project. Alis-Daniela Torres, Officer for Built Infrastructure and Sustainable Energy, ICLEI Europe, contributes to the discussion with reflections about the use of the HRE energy profiles. Ulrich Reiter, TEP Energy, will present the methodology about calculating the costs for reducing heating and cooling demand in buildings. Rasmus Lund, Assistant Professor, Aalborg University, will host the session and Maarten De Groote, Head of Research at the Buildings Performance Institute Europe, will participate in the discussion. HRE Results: What is the main outcome from the project? The energy scenarios for 2050 are presented along with the key findings of the energy modelling. In this session, Aalborg University’s Brian Vad Mathiesen, Professor and HRE coordinator and Rasmus Lund, Assistant Professor, present the results from the future energy system analysis, focusing on the ways to decarbonise the heating and cooling. HRE results: Heating and cooling strategies for countries and regions where the gas sector is substantially developed and accounts for a large part of the energy supply. Wouter Nijs, ir., Project Officer in the Joint Research Centre (JRC), will talk about the contribution of JRC-EU-TIMES model in HRE project and its combination with other tools. HRE results: Heating and cooling strategies for countries and regions where heat planning is long tradition and district heating is substantially developed and accounts for a large part of the energy supply. HRE results: Heating and cooling strategies for countries and regions where the existing infrastructures for heating and cooling supply has been deteriorated or outdated. Cool Roadmaps in Europe: HRE presents the most recent results on cooling demands and the future of cooling and district cooling in EU. HRE results: Heating and cooling strategies for countries and regions where the amount of heat demand is not reflected in the current energy planning and the need for heat planning has been undervalued. The final outcomes of HRE presents as guidelines for local, national and EU lead users of HRE tools and findings.